game but out of the blue Under 13 Jade Murphy produced a stunning High Jump result. She put 11cm on her previous best to clear 1.51m taking her to a joint second on the UK rankings list. The Liverpool Pembroke Sefton girl is part of the highly successful squad coached at Edge Hill University by Dave McComb who is getting used to extraordinary performances by members of his group. Another High Jumper, senior Billy Williams, leapt 1.90m, only a fraction short of his previous week`s 1.93m personal best. Senior athletes were thin on the ground but Jesse Roberts(51.7) and Sean Bosman (53.0) will be satisfied with their 400m results, as will Ryan Blackwell with a 800m clocking of 2.01.1. Alistair Nelson ran a 4.20.2 1500m. Kirsty Longley went to the match with the deliberate intention of taking her 3000m time under 10 minutes but the lack of competition left her running alone and she closed in with 10.05.4. 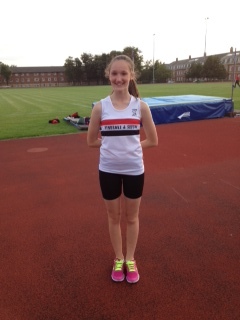 There were even fewer Under 17`s but Corinne Molyneux managed a confident 1500m win in 5.27.5. Of the Under 15s Jack Stopforth ran a respectable 100m in 13.1 as did Ed Latimer at 400m (56.0) and Matt Richardson 800m (2.19.8). Ed will also be happy with his 4.79m Long Jump. Among the girls Evelyn Smalley has shown excellent form this season and strung together a 100m in 13.6, 200m in 27.5 and Long Jumped 4.33m. Morag Molyneux emulated her older sister with a 1500m win but with an even faster and eye-catching time of 5.05.0. The diminutive Charlotte Mawdsley again produced a decent 800m in 2.36.3. The stand out performance in the field was possibly Ben Harding`s Javelin throw of 34.08m. At Under 13s there was another success story in the High Jump with Kai Finch on 1.43m with Owen Southern (1.40m) breathing down his neck. Lauren Lewis forsook her favourite 100m for a Long Jump of 3.75m, a Shot Putt of 6.74m and Javelin of 10.97m. Ross Harrison produced a good 2.31.9 time in a highly competitive 800m. Athletes like Connor McIlwaine, Lauren Ramsey and others while not figuring highly were nevertheless posting personal bests elsewhere. But the day, in the end, undoubtedly belonged to Jade Murphy.